Aside from her Centropa column, Essen Around, Jayne is also the author of one of our very favorite books, Jewish Holiday Cooking, which was shortlisted for the James Beard Award, as well as The Gefilte Variations. 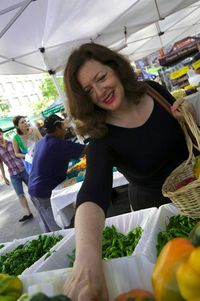 Jayne writes for print and web publications including The New York Times, Los Angeles Times, Boston Globe, Gourmet and Bon Appetit magazines, Epicurius.com, among others, and was the featured cuisine writer and food blogger at Beyond Brisket for Jewish Woman Magazine. She lectures extensively about Jewish cuisine and culture, from radio and TV programs to London’s Gefiltefest, and has put together and moderated an annual program on Jewish cuisine around the world at New York’s Museum of Jewish Heritage for the past seven years. A native New Yorker, Jayne lives in Greenwich Village with her husband, and their daughter Alexandra returns home to cook at every holiday.